SAN DIEGO — San Diego’s North Embarcadero Visionary Plan — designed to create an attractive “front porch” for the city waterfront — is on its way to becoming a reality. The Board of Port Commissioners awarded a construction contract for Phase 1 of the project at its Nov. 8 meeting. The winning bid for the project, aimed at beautifying and opening up San Diego’s waterfront, came in 22 percent lower than the engineer’s estimate of $23.6 million. At $18.6 million, Stanton-based USS Cal Builders’ bid is expected to save the city nearly $7.5 million on the proposed $28.6 million project, with the total cost to include $2.5 million for design and management. USS Cal Builders was the low bidder, beating out two San Diego-based firms: 3-D Enterprises, which bid at $19 million; and T.B. Penick & Sons, which bid at $22 million. Capital project manager Linda Scott said the project will be divided into two parts. Phase 1-A will improve the existing West Broadway roadway from North Harbor Drive east to the railroad tracks, including lowering an existing crest, reconstructing the existing roadway and creating a raised landscaped median. Phase 1-B will realign North Harbor Drive from B Street Pier to Navy Pier, creating room for a 105-foot-long, 30-foot-wide promenade that would include formal gardens, a walk-up café, information booths, public restrooms and a public plaza at the foot of West Broadway. The bidding process and decision-making were conducted in coordination with the Centre City Development Corp. board, which oversees downtown redevelopment. Although there were 39 prospective bidders, the project team recognized early that the number of bidders would likely be limited by the project’s complexity. USS Cal Builders has built several public facilities, including Costa Mesa’s police station, the city of Vernon’s fire station and numerous educational facilities. 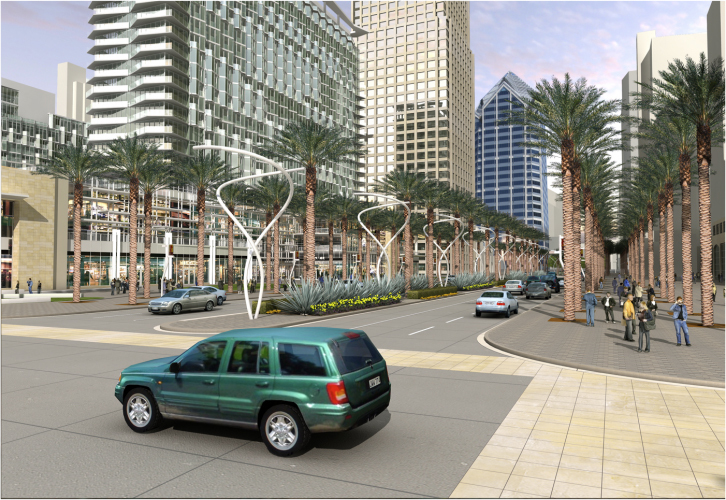 The port, the city of San Diego and Centre City Development Corp. will host a groundbreaking ceremony at 10 a.m. Jan. 5, 2012. Construction is anticipated to take about 18 months.